On Monday, the 24th of December, Christmas Eve, the euro rose against the US dollar by the end of the day. Market activity was average. The focus was on US stocks and oil markets. Stock indices fell from 2.2% to 2.9%. Oil dropped by 6%. The markets were rocky over rumors that US President Donald Trump was discussing the possibility of dismissing US Federal Reserve Chairperson Jerome Powell, followed by news that he wanted to dismiss Secretary of the Treasury Steven Mnuchin. Markets in Australia, Canada, New Zealand, Switzerland, Great Britain, and Germany are closed. The foreign exchange market was closed on Tuesday. The current rate is 1.1406. As the holidays continue across Europe, I don't expect high market volatility until the US session. 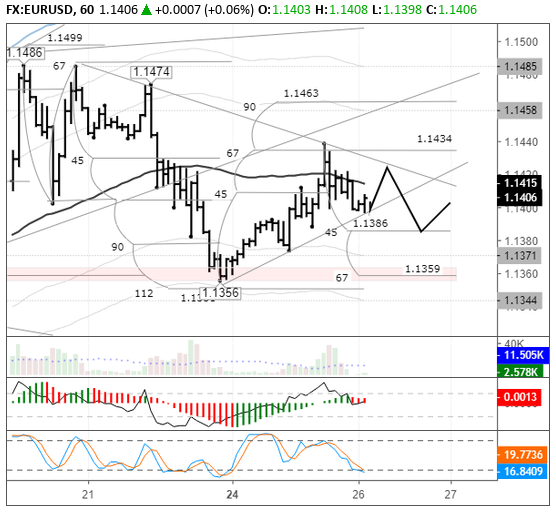 The price is at the trend line of corrective movement from a low of 1.1356. From there, I am expecting a recovery to another trend line from the top of 1.1485. When reaching 1.1420/25, the Stochastic will climb into the sell zone. This will be the reason why robots that use trading signals to trade in a range will begin to start selling euros. I'm considering the level of 1.1386 as a target. If the Americans start selling the euro aggressively in the thin market, their attention should switch to 1.1359.